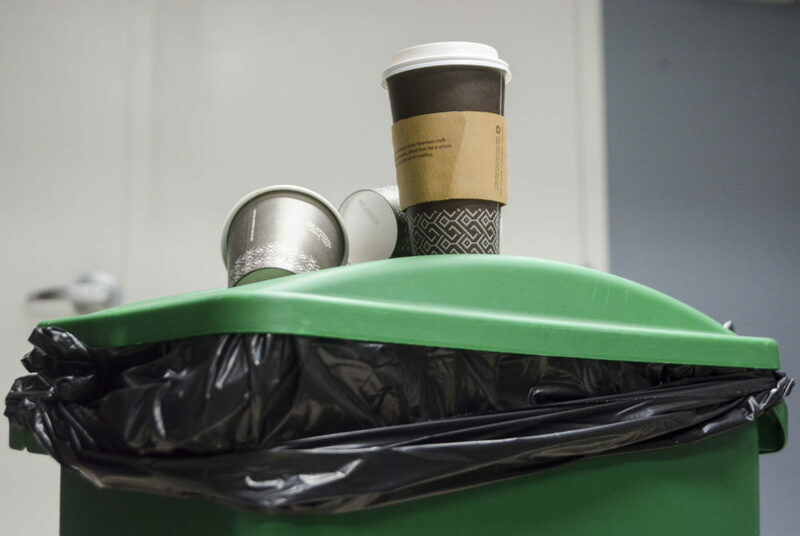 The University plans to accept hot beverage containers for recycling under new recycling guidelines being implemented by D.C. Department of Public Works beginning in January. Students will be able to dispose of their morning Starbucks coffee cups in recycling bins starting this January. The University plans to accept hot beverage containers for recycling – in addition to containers for cold beverages that were already accepted – under new recycling guidelines being implemented by D.C. Department of Public Works and other departments beginning next year. University spokesman Tim Pierce said the University plans to send email and social media updates to the campus community about the adjustment and install signs at “key locations” throughout campus advertising the new guidelines. “GW is aware of the changes proposed by the D.C. Government and is pleased to hear of them since there has often been confusion in the community as to whether items such as coffee cups are or aren’t recyclable,” Pierce said in an email. Officials also plan to work with the Student Association, Residence Hall Association, Eco Reps – sustainability leaders based in residence halls – and other sustainability-focused groups to spread the word about the policy change, Pierce said. The University does not expect the new recycling policy to greatly change the amount of recycled waste at GW because the new items do not weigh very much, he said. For fiscal year 2017, the University recycled 1,128 tons of waste – a diversion rate of 31.9 percent. Last year officials announced a sustainability plan aiming to recycle 40 percent of all waste by 2020 through boosting composting, solar compacting and recycling. Since 2006, the University has seen a 19-percent decrease of tons of waste sent to landfills, according to a report released by the Office of Sustainability Friday. Annie White, the manager of Office of Waste Diversion for D.C.’s DPW, said this will be the first time the District is standardizing its list of recyclables across the city. She said the policy change and increased recycling outreach will hopefully bump recycled waste 2 to 3 percent in the city. In addition to paper and plastic cups, people will now be able to throw pizza boxes, to-go containers, plastic produce, deli and bakery containers, plastic and paper plates and lids in recycling bins, according to the DPW’s press release from Oct. 5. The D.C. mayor reviews the list of recyclables and decides whether to add or remove items biannually, according to a D.C. law passed in 2014. Pizza boxes and plastic to-go containers are already recyclable items at GW if they don’t have food contamination. The materials recovery facility where recyclables are processed determines which paper and plastic plates are accepted, Pierce said. All homes and buildings with three or fewer units can start recycling the new materials now. By Jan. 1, all residents, commercial properties, apartment complexes, office buildings and restaurants will be required to recycle the new items, White said. To enforce the changes, D.C. will require residents and businesses to have adequate containers for recycling and keep recycling in a separate container. White said landlords will be required to have annual communication with tenants about what is recyclable, White said. DPW partnered with the Department of Energy and Environment and the Department of General Services for the expansion and to launch a website with printable signs covering what can be recycled, according to a release. D.C. decided to bring new items onto the list after the city interviewed eight material processing facilities — which process recycled waste — within a 45-mile radius and found out that the majority of the units would accept the listed items, according to the release. Nikolas Michael, a member of Fossil Free GW, said the most effective way to advertise the change in guidelines would be to post signs above campus recycling bins. He said students usually make their food disposal decisions about 20 seconds before putting an item in the trash or recycling. Jeremy King, the sustainability director at Denison University in Ohio, said when his University allowed community members to recycle all plastic items, people threw in non-recyclable items because they were confused. That could cause all of the recyclables in a bin to be sent to a landfill instead, he said. “It’s a challenge because people will often just throw whatever it is, whether it’s recyclable or not, in the first bin they come to,” he said.